Not to be confused with Command & Conquer: Red Alert 3. Command & Conquer 3: Tiberium Wars is a military science fiction real-time strategy video game developed and published by Electronic Arts for the Windows, Mac OS X and Xbox 360 platforms, and released internationally in March 2007. The direct sequel to 1999's Command & Conquer: Tiberian Sun by Westwood Studios which was taken over and liquidated by EA in 2003, Tiberium Wars returns the Command & Conquer series to its roots in the Tiberium story arc of the franchise, again featuring the factions of the Global Defense Initiative and the Brotherhood of Nod, and also introducing a new extraterrestrial faction known as the Scrin. An expansion pack to Tiberium Wars, titled Command & Conquer 3: Kane's Wrath, was released on March 24, 2008. Tiberium Wars takes place about sixteen to seventeen years after the events of Tiberian Sun: Firestorm, at the advent of and during the "Third Tiberium War" when the Brotherhood of Nod launches a worldwide offensive against the Global Defense Initiative, abruptly ending 17 years of silence and temporarily crippling GDI. With the odds tipped in the Brotherhood's favor this time, GDI field commanders rally their troops and begin to combat Nod's second re-emergence, trying to restore lost hope. In the middle of it all, a new playable faction appears: the alien Scrin. Command & Conquer 3 features returning aspects of gameplay from the previous series. The player oversees the action, ordering multiple units to move and attack targets. The construction yard, a moveable base, is the central platform from which the player constructs other structures. Certain structures can then produce units and resources are needed in order to fund the continuous building of structures and units. Typically the player's primary goal is to defeat an enemy by assaulting and destroying their base, while defending their own. A supporting structure, a crane, can be constructed which can also construct structures. Thus, when multiple production structures of the same type, such as cranes and barracks, are built, the player is given more queues from which to train and produce units and structures. Though these simultaneously save time, funds are deducted for the extra cost as well; careful management of production, training units and funds are key to strategy. When a structure is built, the player can select anywhere near an existing structure to place it, gaining more territorial control. Tiberium is the sole resource and is usually gathered from fields of Tiberium crystals scattered around the map. The crystals are gathered by harvester vehicles which unload their cargo into refineries, supplying the player with credits which are then automatically used when training units and building structures. Certain maps also feature Tiberium spikes, which, when captured by the faction's engineer unit, allocate a certain number of funds per second. Other neutral structures, such as an EMP weapon, are also present on maps to be captured. Base defense is provided by specialized defensive towers which are placed within a structure's territory. All three factions have structures and units with similar functions at their disposal. However, they are adjusted to fit each faction's theme and have somewhat varying properties. Units can be classified into infantry, vehicles and aircraft, each with their own specialities. Unit effectiveness against opponents follows the rock-paper-scissors principle found in most real-time strategy games. Virtually every type of structure in the game acts as a tech tree and additional units, structures and faction-specific abilities will become available to research and create as new structures are built. Production and construction may become temporarily blocked if the required structures are destroyed, or if they are not provided with adequate power by the supporting "power plant" structures. A highly destructive superweapon for each faction can also be constructed and used after a certain timer expires. Once used, the timer must expire again before the superweapon can be activated for an additional time. There are three factions playable in the game. The Global Defense Initiative fights with conventional modern weapons and tactics, utilizing both technologically advanced armor and firepower, making them typically more destructive in open confrontations, but more cumbersome. GDI's special weapon is the quintessential Ion Cannon, an orbital laser guided energy strike. The Brotherhood of Nod features flexible guerrilla warfare forces, using stealth and Tiberium-based weaponry, though they are typically weaker. Like in the original Command & Conquer, their superweapon is a Nuclear Missile. The third faction, the alien Scrin, features units and structures that are Tiberium based, including the ability to promote the growth of the substance and to store infinite amounts of it. The Scrin are immune to the radioactive effects of Tiberium but vulnerable to anti-Tiberium weapons. Their superweapon is the "Rift Generator", which creates a wormhole that pulls in nearby units. The story driven single-player mode of Command & Conquer 3 consists of 38 missions, spread over three campaigns (17 GDI missions, 17 Brotherhood of Nod missions, and 4 Scrin missions). Each campaign depicts the view of its respective faction on the globalized "Third Tiberium War", with the portrayed story being furthered by full motion video cutscenes which play in between each of the individual campaign missions. Players can select to start with either the Global Defense Initiative or the Brotherhood of Nod campaign. However, both campaigns of the traditional two factions are required to be completed before the bonus campaign of the new third Scrin faction is unlocked and becomes playable. Each campaign mission features main objectives, the completion of which will instantly end the mission successfully. Several optional bonus objectives are also available to be completed. Completing optional objectives usually gives the player a tactical advantage in order to complete the main objectives or provides reinforcements or supplies upon completion. All campaign missions can separately be given a difficulty rating on the "theater" screen before they are started; the available difficulty settings range from "Easy" to "Normal" to "Hard". As the player progresses through one of the campaigns, new entries in the game's "Intelligence Database" become unlocked, providing the player with additional background information on the storyline, the factions, as well as their units and structures. Several of these database entries require the player to complete the bonus objectives of the various missions before they can be accessed. When a player completes a mission, they are awarded a medal on the campaign screen, which progresses to gold if completed on the hardest difficulty. Two extra ribbon decorations are also attained on the medal if the player completes the bonus objectives and finds the intelligence. All cutscenes which the player has unlocked by progressing through the campaigns are made available for viewing at any time within the game's menu. The skirmish mode in Tiberium Wars is essentially the game's arena or sandbox mode, where the player chooses teams and factions to battle against until the enemy's base is destroyed. Numerous AI settings embody a type – or a combination of types – of classic RTS strategies, such as "turtler", "rusher" and "steamroller". These behavioral settings can additionally be given a difficulty rating ranging from "Easy" to "Medium" to "Hard" to "Brutal", along with "handicap" settings that can be applied to either the AI, the player, or both. Whenever a skirmish mission is successfully completed, a star is placed next to the map in the skirmish menu, showing that the player has won the skirmish on a certain difficulty level. Command and Conquer 3: Tiberium Wars supports multiplayer games over LAN, and online play, originally over GameSpy servers. After the shutdown of GameSpy in 2014, community-based alternatives were developed. Players can participate in "1v1", "2v2", and clan-based "1v1" and "2v2" ladders – each using separate Elo rating systems – or they can elect to play unranked. Broadband-based multiplayer features VoIP support. Electronic Arts was making an attempt through Command & Conquer 3: Tiberium Wars to market "RTS as a sport", through a project entitled "BattleCast". A service centred on the game's official website, "BattleCast" is designed to allow for players to schedule upcoming games with others, to spectate in games that are being played, and to serve as a centralised replay archive of matches. "BattleCast" additionally allows for players to function as commentators in a game, providing a running description of the match as it unfolds. Commentators can talk to other observers of a game through "BattleCast", and use a Paint-style brush to draw onto the screen. A free "BattleCast Viewer" is available for download from the official C&C website. This viewer will allow for people who do not own the game to watch others playing. Player may also download custom maps. The storylines of the game's three factions are closely interwoven in the same fashion seen in the Firestorm expansion pack of Command & Conquer: Tiberian Sun. In any one faction's campaign, references are made to the events and missions that occur in the campaigns of the other two factions. Command & Conquer 3: Tiberium Wars begins in 2047. While the conflict between the Global Defense Initiative and the Brotherhood of Nod has subsided substantially, Tiberium infestation has begun to reach critical levels and continues to destroy the Earth's ecosystems at an alarming rate. This has prompted GDI to divide the world into three different geographical zones based on the levels of local infestation. 30% of the world's surface has been designated as "Red Zones", which have suffered the worst infestation and can no longer support human life. 50% of the regions in the world have been designated as "Yellow Zones", which are dangerously infested yet contain most of the world's population. Decades of war and civil unrest have left these regions in a state of social collapse and have continued to provide the Brotherhood of Nod with opportunity for concealment as well as large-scale recruitment over the years. The remaining 20% of the Earth's surface is unscarred by Tiberium and is relatively untouched by war. These "Blue Zones" are considered the last refuge and hope of the human civilized world and have been placed under the direct protection of the Global Defense Initiative. In March 2047 the Brotherhood of Nod suddenly fires a nuclear missile at GDI's orbiting command station GDSS Philadelphia, destroying the fulcrum of GDI's senior command structure in a single major blow, after taking out their anti-missile defense station in Goddard Space Centre in a surprise raid. Since the end of the Second Tiberium War, Nod has silently built up its influence and its military potential into the status of a true superpower, and by providing enforcement of stability, strategically placed medical aid and hate-mongering against GDI and the Blue Zone populations from within the Yellow Zone territories, the Brotherhood is now supported by a significant percentage of the world's population. Unprepared to handle the Brotherhood's coordinated offensives across the entire globe, the remainder of the Global Defense Initiative's top military and political officials take charge and begin rallying all of their standing forces, determined to turn the tide and achieve a new victory over Nod. As the conflict unfolds however, extraterrestrial forces known only as the "Scrin" suddenly enter in the battle, and alter the nature of the Third Tiberium War entirely. After driving the invading Brotherhood of Nod forces out of a number of the world's Blue Zones, GDI's General Granger (Michael Ironside), acting on intelligence gathered from Nod POWs, begins to fear that the Brotherhood may be preparing to use WMDs and orders a pre-emptive strike on a Nod chemical weapons facility near Cairo, Egypt. Once there, GDI discovers that Nod was not only preparing to deploy their full nuclear arsenal on them, but that they are also in the process of manufacturing a liquid Tiberium bomb of unprecedented destructive power. The swiftness of GDI's response prevents a pending nuclear strike from Nod, but Kane continues the construction of the liquid Tiberium device unabated within his newly erected "Temple Prime" in Sarajevo. Temple Prime subsequently comes under siege by GDI forces. General Granger plans to lay siege to the site until Kane and his Inner Circle would surrender, but Director Redmond Boyle (Billy Dee Williams) orders the use of the ion cannon upon Temple Prime to eliminate Kane's threat "once and for all". When the ion cannon is fired over Granger's strenuous objections, it detonates the liquid Tiberium bomb inside the temple, creating a cataclysmic explosion that reaches out into space and kills millions of people in Eastern Europe's Yellow Zones. Kane and his Inner Circle are believed to be among the casualties. Shortly after these disastrous events, GDI's deep space surveillance network suddenly begins to detect multiple large unidentified objects rapidly closing in on Earth. Director Boyle orders the ion cannon network to be turned against the vessels, but the craft are unfazed by the attack and alien forces, known only as the Scrin, land on Earth and begin to swarm throughout the world's Red Zones, soon after launching massive assaults on all major cities across the globe. GDI realizes these attacks are meant to divert their attention away from the construction of massive tower structures in the world's Red Zones. Kane, who somehow escaped alive, reveals to the Nod player commander that he deliberately started the war with GDI to provoke the ion cannon attack on Temple Prime. It was the only thing that could detonate his liquid Tiberium bomb with sufficient power to lure the Scrin to Earth. It was the Scrin who seeded the Tiberium on Earth, and they took the Tiberium explosion as a sign the planet was ripe for harvesting. Kane hopes to seize one of the Threshold towers the Scrin are building, which are interstellar teleportation devices they use to ship Tiberium offworld. The Scrin, for their part, realize they were tricked into coming too early, since the overwhelming majority of the planet's Tiberium deposits are immature. They also did not anticipate such heavy resistance from the humans, whom they thought were driven to extinction by the Tiberium. Curiously, they recognize Kane from their databanks, and seek to learn more about him. However, the organized attacks on the towers endangers the Scrin player commander's safety, forcing them to focus on protecting and completing at least one tower to allow their escape. GDI succeeds in destroying all but one of the towers, which is protected by elite Nod forces, and the Scrin are able to finish the tower's construction just before GDI destroys their central control node in Italy. With the tower completed, it becomes invulnerable to all known forms of human weaponry and GDI is left with no option but to leave it standing under close observation, as it is completely inert following the destruction of the control node entity. Kane prepares to enter the tower using key codes stolen from the Scrin forces. At the end of the Nod campaign, Kane welcomes the Nod Commander to his Inner Circle. The GDI campaign has two endings, depending on whether the GDI Commander uses a GDI-built liquid Tiberium bomb in the final mission. If the bomb is used, the Scrin are defeated at the cost of massive collateral damage. The commander becomes a hero and Granger resigns from the GDI military in disgust. However, if the bomb is not used, Boyle resigns to avoid being tried as a war criminal. The Scrin, meanwhile, plan to invade Earth with a larger force. A sequel to Command & Conquer: Tiberian Sun had been expected since the game's release in 1999. Work on such a sequel was believed to have been started at Westwood Studios in 2001, however Electronic Arts decided to shift the focus of the would-be successor to Tiberian Sun from a science fiction theme to a modern theme based on contemporary real-world conflicts, the result being the title of Command & Conquer: Generals and other SAGE engine based games. Developers still retained the Command & Conquer 3 idea (tentatively named 'Incursion'), intending it to be an update of the original C&C game in terms of gameplay and setting. Just prior to the release of Generals however, EA announced that Westwood Studios (Las Vegas) would be closing and would be consolidated into EA Los Angeles. This merger split the original Westwood team, with some of its members not being willing to relocate and quitting to form the company Petroglyph Games, with the remainder moving to Los Angeles to work at the newly consolidated studio. With this, the development of Command & Conquer 3 was effectively put on hold. Early concept artwork of GDI Zone Troopers crossing a Tiberium field. In 2004, old concept art from Westwood Studios was made public under the name "Command & Conquer 3". The artwork showed a "mech" unit, a full 3D RTS gameplay environment similar to that used in the title Generals, and the original interface system from both the original Command & Conquer game and its sequel of Tiberian Sun. The unveiling of this artwork fueled speculation that Electronic Arts had begun work on a Command & Conquer game. 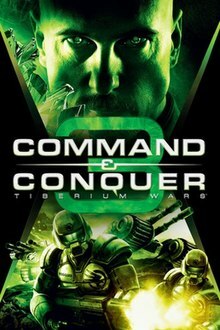 In December 2004, after the EALA team settled down, then executive producer and Command & Conquer lead Mark Skaggs announced in a mass e-mail that this next Command & Conquer game would be Command & Conquer: Red Alert 3, and not the awaited sequel to Tiberian Sun. Shortly thereafter however, Mark Skaggs left EA for unspecified reasons and ideas for the Red Alert 3 title were mothballed. Mike Verdu later became the new lead on the Command & Conquer series. On April 18, 2006, Command & Conquer 3: Tiberium Wars was prematurely announced. On April 20, the official press release was made, and Electronic Arts Los Angeles would begin to host several fan summits for previews, feedback and discussions on the new title. Tiberium Wars was released in three separate editions; the pre-order edition, the standard edition (box art featured at the article header) and the Kane Edition, which constitutes a special collector's edition with various extras and a bonus DVD featuring exclusive content. Tiberium Wars was given a suggested retail price of US$49.99, while the C&C 3: Kane Edition is available at "select retailers" with a suggested retail price of US$59.99 in the USA. It is also sold in the Command and Conquer: Saga bundle pack, along with Command & Conquer: The First Decade. The game was additionally released for the Xbox 360 in May 2007, Support for the Xbox Live Vision Camera is included. The official map editor for Command and Conquer 3: Tiberium Wars was released on April 20, 2007. A modified version of the SAGE engine is used to run Command & Conquer 3's graphics. SAGE technology had been used in the RTS series Generals and The Battle For Middle-Earth games, and the engine's features subsequently are present in C&C 3. The soundtrack for Tiberium Wars was composed by Steve Jablonsky and Trevor Morris. Frank Klepacki – the composer of all the previous C&C installments with the exception of Command & Conquer: Generals – was contacted by Electronic Arts to compose the soundtrack for Tiberium Wars, but turned the offer down to focus on his career at Petroglyph Games. The titles of some songs show references to Command & Conquer: Renegade. Music is itself futuristic and is reflected in military and desert themes. Joseph D. Kucan reprises his role as Kane, the leader of the Brotherhood of Nod. Tiberium Wars also features Tricia Helfer as Nod General Kilian Qatar, Josh Holloway as Nod Intelligence Officer Ajay, Michael Ironside as GDI General Jack Granger, Jennifer Morrison as GDI Intelligence Officer Kirce James, Grace Park as Lt. Sandra Telfair, and Billy Dee Williams as GDI Director Redmond Boyle. The cutscenes of Command & Conquer 3: Tiberium Wars were directed by EA in-house cinematic director Richard Taylor. On August 14, 2007, the Electronic Arts team for Command & Conquer 3: Tiberium Wars launched an online television-style broadcast under the title of "BattleCast Primetime", which was meant to periodically provide C&C fans with information and news on future Tiberium Wars-related developments, expansion packs and patches. During "BattleCast Primetime"'s pilot episode, the expansion pack to Tiberium Wars, entitled Kane's Wrath, was officially announced. A novel based on the game was written by Keith R. A. DeCandido, and released by Del Rey Books in June 2007. The story is set simultaneously during the events of Tiberium Wars. Many game characters are either featured or mentioned such as Kane, Lieutenant Sandra Telfair, Gen. Jack Granger, and W3N reporter Cassandra Blair. The novel describes the actions of GDI's 22nd Infantry Division, led by Michael McNeil, who are decorated as heroes for their adventures, as well as describing the effects of Tiberium on the world with a trip to Atlanta by W3N reporter Annabella Wu. Atlanta is a "Yellow Zone" partially infested with Tiberium but still under GDI control. The story alternates between the experiences of Ricardo Vega (nephew of Nod's General Vega) and Annabella Wu during the conflict. PC Gamer U.S. gave the game its "Editor's Choice" rating at 90%, stating that "One of the greatest RTS franchises of all time returns to glory", While PC Gamer Sweden and UK gave it a more reserved rating of 81% and 82% respectively, stating that it was "A welcome, but limited, return". GameSpot gave the game a 9.0 out of 10 and the "Editor's Choice", referring to Tiberium Wars as "one of the finest real-time strategy games in years." IGN labelled the game as "great", rating it at 8.5/10. GamePro gave Command & Conquer 3: Tiberium Wars its "Editor's Choice" rating at 4.5 out of 5, designating it as "Game of the Month" in its June 2007 issue. UK magazine PCFormat gave the game an 81% rating and praised the "greased eel-slick presentation and explosive, ripping action" which makes Command and Conquer the "distillation of what RTS is all about", however it also criticised the lack of innovation present. Finnish game magazines Pelit and MikroBitti gave it 89/100 and 4/5, respectively. MikroBitti applauded the game's appearance and sounds, but criticised it for lack of loyalty to the early Command & Conquer game mechanics. UK magazine Edge gave the game a rating of 7. Due to the intentionally faithful recreation of the original Command and Conquer experience, the magazine felt that the game's strategic formula was too dated in comparison to more strategic titles available in the real-time strategy market. Command & Conquer 3 sold 128,000 units in the week after its release, and one million units were reported as sold by May 31, 2007. Its computer version received a "Gold" sales award from the Entertainment and Leisure Software Publishers Association (ELSPA), indicating sales of at least 200,000 copies in the United Kingdom. The Academy of Interactive Arts and Sciences (AIAS) gave Command & Conquer 3 the Best Strategy/Simulation Game of the Year for 2007. ^ "EA Command and Conquer 3 Tiberium Wars" (in German). Electronic Arts Germany. March 12, 2007. Archived from the original on April 29, 2007. ^ a b "EA Command & Conquer 3 Tiberium Wars – News". Electronic Arts, Command & Conquer website. March 12, 2007. Retrieved March 12, 2007. ^ a b "IGN: C&C3 Gets Demo, Release Date". IGN. April 11, 2007. Retrieved April 12, 2007. ^ "Command and Conquer 3 Details". Electronic Arts. Archived from the original on June 14, 2007. Retrieved June 16, 2007. ^ Dave McCarthy (December 22, 2006). "Command & Conquer 3: Tiberium Wars interview". Eurogamer. Retrieved January 27, 2007. ^ a b "Command & Conquer 3: Tiberium Wars (PC)". Gamespy staff. Archived from the original on July 23, 2007. Retrieved November 18, 2007. ^ "Command and Conquer 3 Details". Electronic Arts. Archived from the original on June 13, 2007. Retrieved June 28, 2007. ^ "Get the free Battlecast Viewer!". Electronic Arts, Command and Conquer website. October 25, 2007. Archived from the original on October 28, 2007. Retrieved October 30, 2007. ^ "Living with Tiberium". Mike Verdu blog entry, executive producer Command & Conquer 3. August 21, 2006. Retrieved December 22, 2006. ^ "Ask Petroglyph!". Petroglyph Games. Retrieved January 2, 2007. ^ Tom McNamara (December 6, 2004). "Red Alert 3 On the Way?". IGN. ^ "EA Announces Command & Conquer 3 Tiberium Wars; The Genre Defining Series is Back!". Electronic Arts. April 20, 2006. ^ "C&C 3 Community Summit feature story". Electronic Arts, Command and Conquer website. January 19, 2007. Retrieved January 20, 2007. ^ a b "Kane Edition Announced". Electronic Arts, Command and Conquer website. December 22, 2006. Archived from the original on December 26, 2007. Retrieved December 23, 2006. ^ "C&C 3 Announced For Xbox 360". Electronic Arts, Command and Conquer website. November 20, 2006. Retrieved December 22, 2006. ^ "C&C 3 Xbox 360 Q&A". Electronic Arts, Command and Conquer website. November 24, 2006. Retrieved February 24, 2007. ^ "C&C3 Worldbuilder Download". Electronic Arts, Command and Conquer website. April 20, 2007. Retrieved April 20, 2007. ^ "Steve Jablonsky, IMDB entry". Retrieved December 19, 2006. ^ "Trevor Morris, IMDB entry". Retrieved June 28, 2007. ^ Frank Klepacki (June 8, 2007). "News at Frank Klepacki.com". Frank Klepacki. Retrieved June 8, 2007. ^ "Casting Line-up Announced for C&C 3!". Electronic Arts, Command and Conquer website. October 18, 2006. Retrieved December 14, 2006. ^ "Bringing C&C To Life". Electronic Arts, Command and Conquer website. November 24, 2006. Archived from the original on December 26, 2007. Retrieved December 14, 2006. ^ "Command & Conquer 3: Tiberium Wars for PC Reviews". Metacritic. CBS Interactive. Retrieved November 14, 2018. ^ "Command & Conquer 3: Tiberium Wars for Xbox 360 Reviews". Metacritic. CBS Interactive. Retrieved November 14, 2018. ^ Peckham, Matt (March 27, 2007). "Command & Conquer 3: Tiberium Wars (PC) Review – 1UP". 1UP. Archived from the original on July 15, 2007. Retrieved September 20, 2008. ^ Meer, Alec (March 26, 2000). "Command & Conquer 3: Tiberium Wars (PC) Review – EuroGamer". EuroGamer. Retrieved September 20, 2008. ^ Adam Biessener, Adam McNamara. "Command & Conquer 3: Tiberium Wars". Game Informer. Archived from the original on June 12, 2007. ^ a b "Command & Conquer 3: Tiberium Wars (PC) Review – GamePro". GamePro. March 27, 2007. Archived from the original on September 27, 2008. Retrieved September 20, 2008. ^ a b VanOrd, Kevin (March 26, 2000). "Command & Conquer 3: Tiberium Wars (PC) Review – GameSpot". GameSpot. p. 2. Retrieved September 20, 2008. ^ Keefer, John (March 30, 2007). "Command & Conquer 3: Tiberium Wars (PC) Review – GameSpy". GameSpy. Retrieved September 20, 2008. ^ a b Adams, Dan (March 26, 2007). "Command & Conquer 3: Tiberium Wars (PC) Review – IGN". IGN. p. 2. Retrieved September 20, 2008. ^ John Callaham (January 2, 2008). "The Top Ten PC Games of 2007". Firing Squad. Archived from the original on February 23, 2009. ^ "EA's quarterly losses, annual income climb". Gamespot. May 10, 2007. ^ HeXetic (May 11, 2007). "C&C3 PC Sold 128,000 in U.S.A. In First Week (1M Worldwide So Far)". Planet CnC. Archived from the original on January 2, 2008.